Stadium in Taipei on August 25. Pitchers dominated the low-scoring affair, keeping the game at 1-1 over the first five innings. In the sixth, first baseman Tatsuki Ohira tagged South Korea starting pitcher Seol Jae-min for a solo homer to lift Japan into the lead for their eventual 2-1 victory. Japan’s middle reliever Masato Morishita mowed down the South Korea hitters with six strikeouts, while closer Wataru Matsumoto threw the final six outs. The Samurai Warriors are to take on the Czech Republic today in their second playoff game. Japan are favored to make the final, which is to take place at Taipei’s Tianmu Stadium on Tuesday. Meanwhile, Team Taiwan played Mexico yesterday in the consolation round for fifth to eight place after South Korea beat them 6-3 on Wednesday, eliminating the hosts from medal contention. 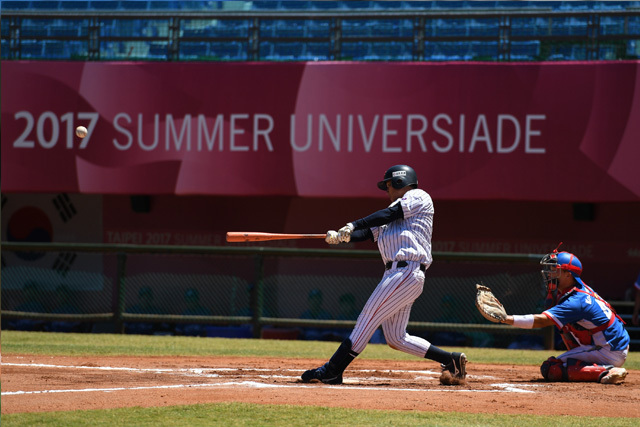 The national baseball squad have been a flop, losing to France and South Korea by committing costly errors and making bad plays. Trying to make it up to their fans, Team Taiwan collected 14 hits, including three home-runs, in their 11-1 thrashing of Mexico. Taiwan starting pitcher Shih Tzu-chien had a quality outing, giving up only one run on six hits over seven innings. Second baseman Wu Chieh-jui led all batters with two homers for four RBIs and three runs. The hosts are to take on Russia today for their second contest of the consolation round.